Samurai Masks have always been a source of fascination for me and it seems, for many others given the influence they continue to have in popular media culture. In this article I'll explore the common varieties of samurai masks from the historical Kabuto (兜, 冑), the helmet worn by the samurai, and the menpō / mengu (face mask) in particular, to the theatrical masks of popular culture. The kabuto or samurai helmet is easily identifiable and immediately striking in appearance. However, they weren't always like that pictured below opposite. 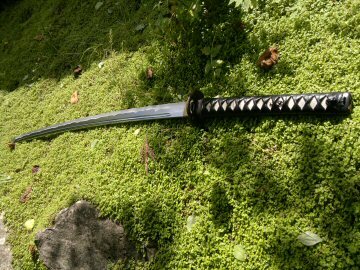 The kabuto developed over a series of centuries in direct reaction to the changes in battle and warfare the samurai experienced. Mabizashi (keiko). This helmet had a horizontal peak, like a Roman centurion's. It was designed to defend against direct downwards or diagonal downward blows. 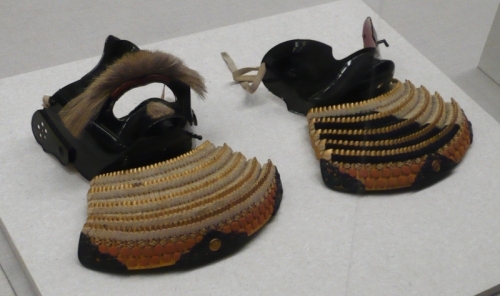 Shokaku (tanko) was a beaked helmet. It was cheaper to make and thus more popular. Both have "sane" (small plates) hanging from the sides to create neck and cheek guards. By the 8th -12 Century AD, known as the Heian Period or classical period we see the start of the typical samurai like helmets known as ikaboshi kabuto. These helmets were characterised by large winged side's called fukigaeshi. The helmets also developed radial segments to create the rounded shape and were characterised by the visible rivets holding them in place. The helmet or kabuto also had a 4cm hole at top for the top-knot, part of the traditional hair style worn by the samurai. It was also used for ventilation. There was no inner liner and it wasn't the most comfortable. The design of this helmet was for defence against overhead attacks from those mounted on horseback and against arrows from above. By the 12th-14th century warfare had changed in Japan. Mounted warriors were no longer the dominant threat and bladed weapons were increasingly being used in battle. 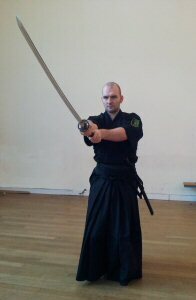 The armour of the samurai changed to reflect this. The kabuto helmet went from 15 triangle segments to 32 with centred rivets. They also closed the top hole and replaced it with a circular ornament, sealing up a potential weak point. The Shikoro, the helmet neck guard which had always hung straight down now was designed in a curving outwards ark. In addition the wing like fukigaeshi were sharply upturned, producing a better view for bowman and better defence against cuts. 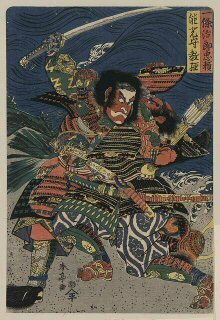 This however did create more exposure of the face and so the samurai masks, the menpō were introduced. These masks known as mengu came in many different forms . Some known as Somen covered the entire face. Others known as Hanbo covered only the chin and part of the neck while Happuri covered the forehead and cheeks in a similar fashion to Roman infantry. The most distinctive of the these however were the menpo, which covered the face from below the eyes to the chin. These incredible masks featured exaggerated snarls and grimace's, and even fierce fangs or teeth, detachable noses and the famous bristled moustache, often made from horse tail hair. These masks were made primarily from iron or even leather and often given a lacquered finishin for both beauty and practical weather protection. Practical as always the samurai mask offered excellent defence against blades and arrows, but also acted as counter balance to the top heavy kabuto helmet. 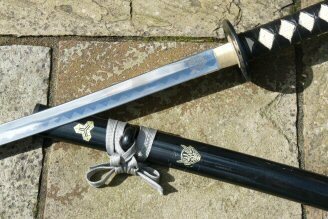 They often had a small hole for drainage at the bottom (fierce combat can work up a sweat) and were tied on with a number of different intricate knots by a chin cord called a "Shinbobi-no-o". These types of helmet and samurai masks became an enduring symbol of the samurai power and rank. They achieved such perfection of purpose that little more advancement was necessary. By the 14th-16th century the only major addition was that of a throat protector, called a nodawa that hung from the menpō. 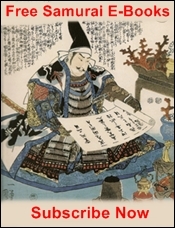 With the 16th century the Samurai had achieved a level of peace in Japan, the battle of Sekigarara in 1603 brought an end to the many years of conflict faced by the feudal Japanese warrior. Over time the practical aspects of samurai masks became distorted. 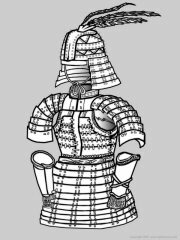 Self conscious commanders wanted distinctive armour and helmets and strove to display their prestige with incredibly large ornament fixed to the kabuto. 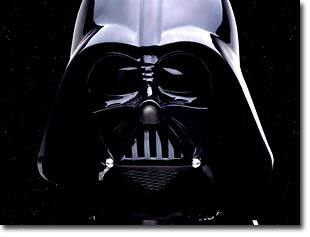 They made the helmet cumbersome and offered no practical benefit as they were often made from paper or bamboo. Samurai Masks are still incredibly impressive and even today are featured prominently in our culture. Today one of the greatest characters of the cinema screen is defined by his samurai mask complete with a jet black kabuto helmet, curving Shikoro neck guard and an fearsome futuristic menpō. 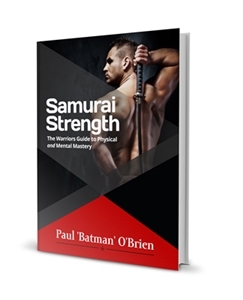 You're been reading about Samurai Masks, learn more about the Samurai Here.